A nervous-looking young man slowly makes his way out onto the empty stage and silently, awkwardly, hobbles to and fro on his feet, as if he's trying to free himself from a pool of honey. Or maybe he's offering up a second-rate Frankenstein impersonation. It's open to interpretation. A few moments later, a petite woman makes her way to the center, using her entire body to mimic his overwrought bulkiness. "Johnson, we're floating in space," the man declares, a hint of relief in his voice. The woman, Jessica Flores, answers almost immediately: "Oh crap!" An improv scene is underway. It's a two-person scene, but there are three people on stage. Behind Flores' scene partner is a woman performing sign language. She's Flores' ASL interpreter. "I can't remember where I parked the ship!" Flores continues. The crowd laughs. She stifles a smile. 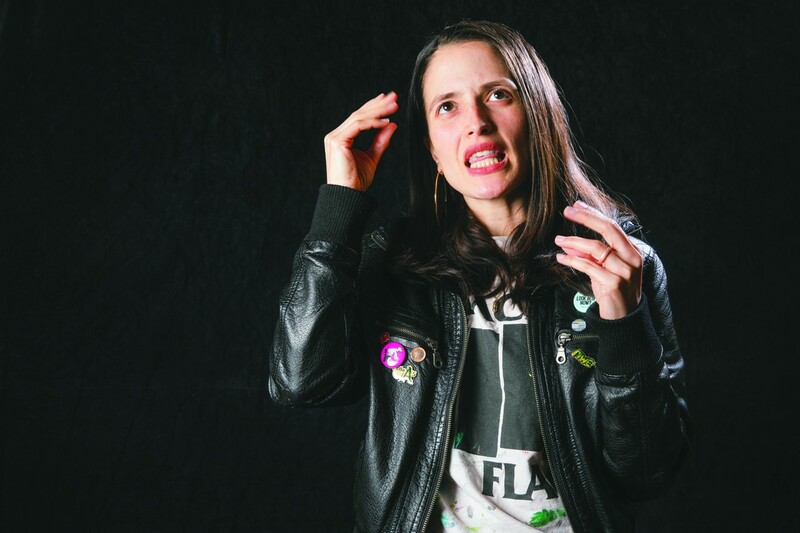 Despite being deaf in both ears, Flores has not let accessibility obstacles stifle her love for improv comedy, one of the fastest-paced, most communication-heavy performance mediums out there. The 30-year-old YouTube sensation, freelance graphic designer, and brand ambassador for Phonak hearing aides has been moonlighting as an improv comedian for about two years. She wasn't always deaf. When Flores was 12, before she lost the majority of her hearing, she took her first improv class and was thrilled by it, inspired by physical comedians like Robin Williams and Rowan Atkinson. But as she entered high school, her hearing declined. And it continued to decline thereafter. Eventually she was unable to communicate with her scene partners, and she dropped out of improv classes. "I grew up being the only deaf person I knew, so I had zero deaf role models in my life," she recalled. There was no one around to teach or practice signing with her, let alone any deaf comedic performers to look up to. "Whenever I would watch something like Whose Line Is It Anyway? or Saturday Night Live, I would think 'Oh, that is obviously a hearing-people thing. There goes my dreams as an improviser.'" Years later, after rediscovering her comedic voice by improvising jokes on YouTube videos to educate the public on the deaf and hard of hearing, Flores decided she was fed up with the deaf community's lack of accessibility to comedic performing arts. She wanted to take her comedy away from the script and camera and onto the stage. At 27, she taught herself ASL and learned how to request interpreters. At 28, she enrolled in her first improv class in 17 years. Now she performs weekly with Endgames Improv in San Francisco. While she has shifted her focus onto live performance over the past few years, Flores still uses her YouTube channel, which has more than 15,000 subscribers, to advocate for the deaf. Her most popular segments address audience questions about the deaf and hard of hearing. They range from existential heavy-hitters ("do you wish you had your hearing back?" spoiler alert: she does not) to the obtuse ("can deaf people think? "), but Flores handles them all in stride with patience and a healthy dose of kiss-off humor. Minutes into watching Flores in one of her videos, it is apparent just how singular her voice she really is. She transforms herself into a collection of zany characters that interact with video animations (she studied animation and visual effects at Ex'pression College for the Digital Arts in Emeryville) in front of a backdrop of her apartment kitchen, every inch of which is covered in her original artwork. On stage and on the camera, she's quick to laugh off mistakes and too-goofy jokes. It took Flores a long time to get this comfortable in her own skin. She has shifted her perspective of deafness a great deal since she was a teenager, a time in her life when she longed to be a hearing person. "The best way that I can explain how that felt is this: Imagine you're at a party, and everybody is having a great time," said Flores. "There's a person going around the party handing out unlimited magical cupcakes. They're passing it out to everybody like, 'And one for you! And one for you!' and then they get to you and they're like 'Um, sorry, you need able to hear to have a cupcake. But the good news is we have an unlimited supply of celery!'" But Flores grew sick of tacitly accepting that being deaf was synonymous with making sacrifices and taking second-rate opportunities. Now, she is proud to be deaf. Her hearing aids, which she used to tuck under her hair to hide her hearing loss, are now on prominent display, decorated in neon blues, pinks, and yellows. She is adamant that deaf and hard of hearing people can participate in any sound-based mediums, including performing arts. "We can do it; we just do things differently," Flores said. In her own unique process for improv, Flores alternates between directly looking at her teammates to lip-read and observe physical cues, through which she comprehends about 30 to 50 percent of the conversation, and focusing on her ASL translators, who will sign out her scene partners' dialogue, which she likens to glancing at the captions on a film. But watching her ASL interpreters and scene partners is only half the challenge. Flores must also use guesswork to fill in contextual blanks. And there is also acting, space-object work (improv talk for miming inanimate objects), and immediately responding to scene partners' suggestions with a quick wit in front of an audience of strangers. Flores makes it look easy, but deaf improv is nothing short of a minor miracle. Contrary to popular belief, the interpreters do not translate the scenes word for word from English to sign language. Instead, they make frequent use of summaries and non-direct interpretations, and scene partners' accents, puns, and other forms of word-play often can be lost. "What might sound funny in English might bomb in ASL," Flores said. "Like if you said 'Ah, piece of cake!' I might have the interpreters sign, 'Ah, easy!' If that happens, if you talk about the actual cake later in that scene, I might get a little lost." But Flores also believes there are plenty of advantages to improvising while deaf. "We are way better at space-object work because most of us gesture with people we can' t understand," she said. During a long class, which involves lots of energy exchange and frequently is overwhelming, Flores also can selectively tune people out and think about how she can improve from her last scene. As in many areas of her life, Flores is a pioneer when it comes to being a deaf improviser. Apart from San Leandro's Deaf Community Center, which occasionally hosts deaf performing arts events, there aren't many formal groups for opportunities for deaf people to participate in improv. "Deaf people in the hearing improv world is not common," Flores said. "Having interpreters for improv is still a very new thing so we are trying to figure out new ways to make improv games more accessible." She wants to lead the charge. Flores plans to use her comedic platform to encourage more people in the deaf community to demand that Bay Area improv schools, like EndGames, Pan Theater, and BATS, as well as training centers in other cities like Upright Citizens Brigade in Los Angeles and Second City in Chicago, become accessible by helping deaf improvisers connect with interpreters. As soon as she completes a contract project to help Google create an ASL-friendly keyboard feature, she plans to spearhead "silent improv" events throughout the East Bay and San Francisco to bring together deaf people who sign with hearing people and deaf people who don't sign so that they can devise better means of communication.